Learning a language takes lots of repetition and practice, but repetition does not have to be boring. Spanish vocabulary review games keep kids engaged and make learning more effective. Games also provide a context for using all kinds of language. Games are useful because if kids are having fun they will play again and again. Play these Connect 4 Spanish vocabulary review games in pairs with any vocabulary you can represent in pictures. You can read more about the educational advantages of games in 5 Reasons to Use Games in the Classroom from Education World. There are dozens of games to engage students with Spanish, and you can adapt many of them to different themes and structures. 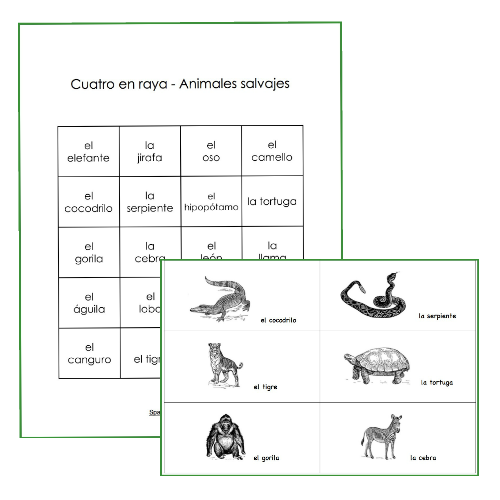 If you’re looking for more specific vocabulary activities, check out all our Spanish vocabulary games grouped by theme. Associating words with pictures is a good way to avoid translation and keep kids in the target language. So, I use lots of picture cards in my games for Spanish class. One of my favorites is 4 in a Row or Connect 4. The game is more interesting and has more stategy than Tic Tac Toe, so it works well with older kids. With little ones, I play Tic Tac Toe or 3 en raya. You can play these Spanish vocabulary review games with any vocabulary that you can represent in pictures. So, if you have picture cards for your theme, these Spanish vocabulary activities require almost no prep. All you have to do is write the words into a table, or have students write them in. To play this game, students choose where they want to put their marker. Of course, there is strategy in terms of blocking the other player and connecting 4 in a row, but the game also allows them to use vocabulary they are familiar with first. So, there are fewer possibilities of matching cards left as they play, and the process of elimination helps them associate the correct picture with the word. Play these 4-in-a-row Spanish vocabulary review games in pairs or in teams. For a game, you need one set of cards and one game board. Print picture cards for the words you want to practice. We usually play with 20 or 36 cards, but you can make the boards different sizes. Add words from a previous theme. This is a great way to spiral in vocabulary. It doesn’t matter if the cards are different sizes and shapes. Use duplicates of some of the cards, and color one of the two pictures. Most of my cards are black and white, so this works well. For example, the board could have la casa and la casa roja, or la flor and la flor morada and you would have cards for both. If your picture cards have text, cut the words off for these Spanish vocabulary review games. The cards can be any size or shape, and they do not need to be the same. Make a board with 20 (4 x 5) or 36 squares (6 x 6). Write the words into the game board. You can have students write them randomly into a grid themselves, or you can make the board with the words. Players spread out the game cards on the table. They decide who will go first. We play pierda, papel o tijera. The first player decides where she wants to put her marker, and reads the word in that square. Next, she finds the picture card that matches the word. When she finds the picture, she can put her marker on the word. If a player chooses the wrong card, she puts the marker on that space instead. The game ends when one player has four in a row or when all the spaces are covered. 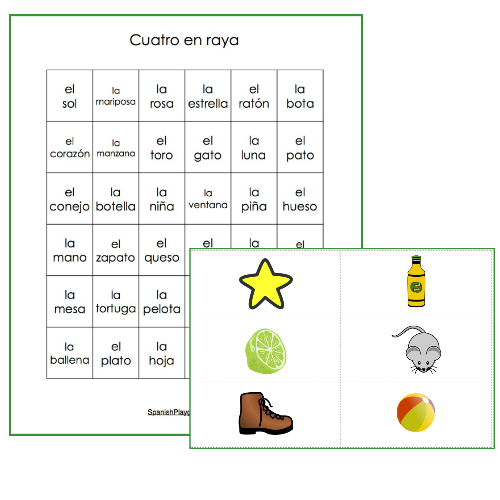 Here are sample boards and cards for Connect 4 Spanish vocabulary review games, but you can make boards for any vocabulary. Sort the cards for vocabulary your students know for each of the letters on the board. 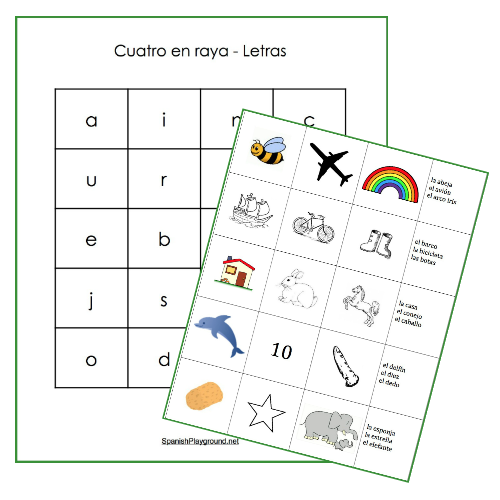 See 9 Spanish Alphabet Activities That Teach Vocabulary for more ways to use these cards. See Spanish Rhyming Words and Activities for more ways to use these cards. 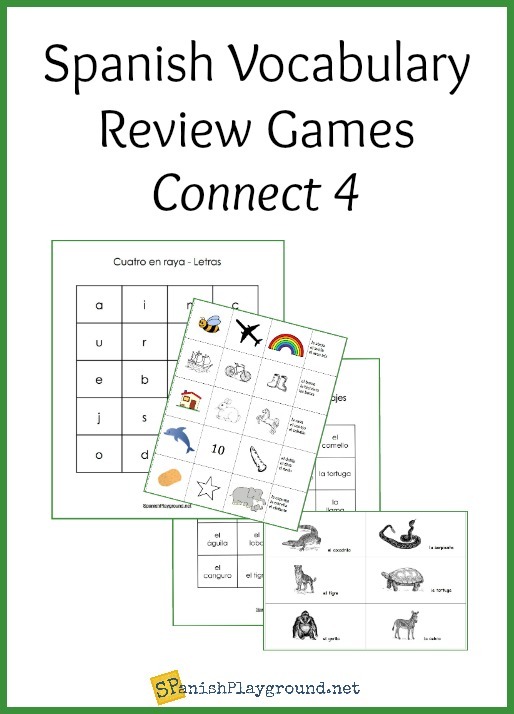 These 4-in-a-row games are one of my favorites to review Spanish vocabulary with elementary or high school students. Do you have favorite review games? Please share in the comments! Hi, thanks for sharing! This is a great idea. One question – how do players know which player put down which marker? Do they usually just remember? Thanks in advance. Hi. We use different colored markers. Counters or small pieces of colored paper work. Anything that is different colors or shapes! Thank you for all of the free material on this site. It helps more than you know. I know my students will enjoy the free printable for sure. You’re welcome! Teaching Spanish to kids can be labor intensive, so it’s nice to share materials. Have fun with the game!